Setting up the ZoomInfo/Salesforce integration makes it possible to quickly send records from ZoomInfo Business Edition and ReachOut to create Salesforce Leads, Contacts, and Accounts as needed. All users who wish to do this must confirm with their Salesforce Admin that the Rest API has been enabled in the back end of Salesforce. Note: if you have questions about your Rest API, please contact Salesforce Support, your Salesforce Account Admin, or the Salesforce Developer for your organization. 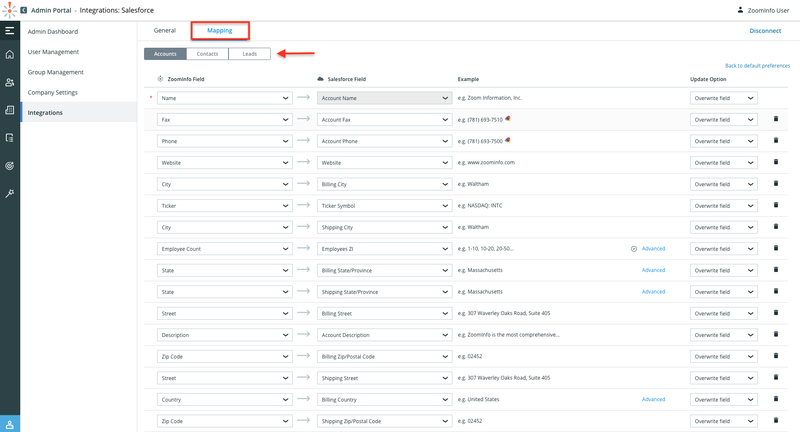 Navigate to the Integrations tab on the left and select Connect under the Salesforce tile. 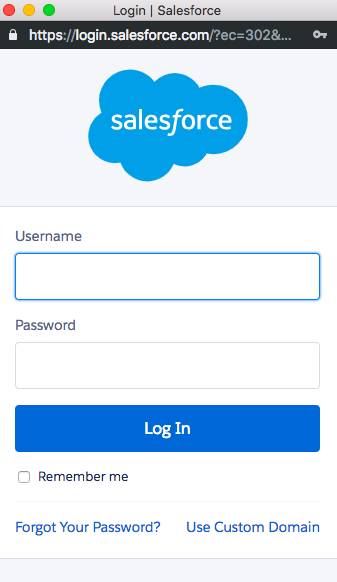 A new window will populate, prompting you to sign in with your Salesforce credentials. Note: Make sure you have pop-up blockers disabled on your current tab in order to see this window. If you're unsure how to do this, please see our disabling pop-up blocker tutorial. After entering your credentials you should receive a successful notification. 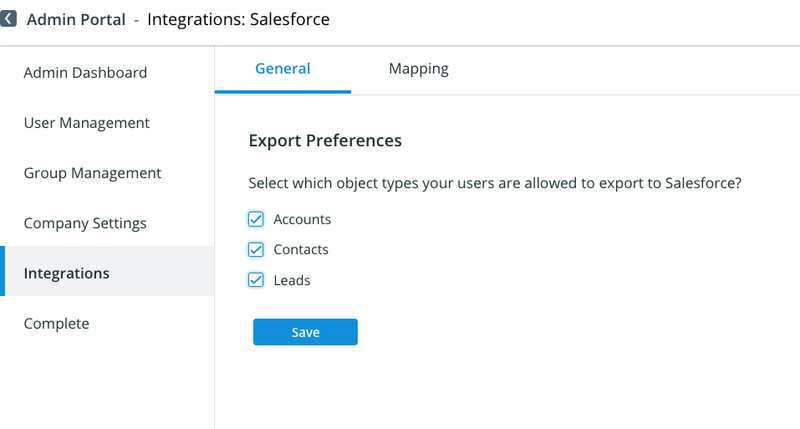 Congratulations, you're connected and can automate data entry from ZoomInfo to Salesforce! If you do not have the Rest API, you can install our native application into Salesforce directly. Click here to learn how to install and configure this application. Please contact the ZoomInfo support team for info on this at clientservices@zoominfo.com or calling 866-904-9666 Option 2. Note: to complete these steps, make sure you've connected to your Salesforce CRM. If you have not done this yet, follow the connecting steps above! Within Admin Portal: Navigate to the Integrations tab and select 'Manage' under the Salesforce tile. 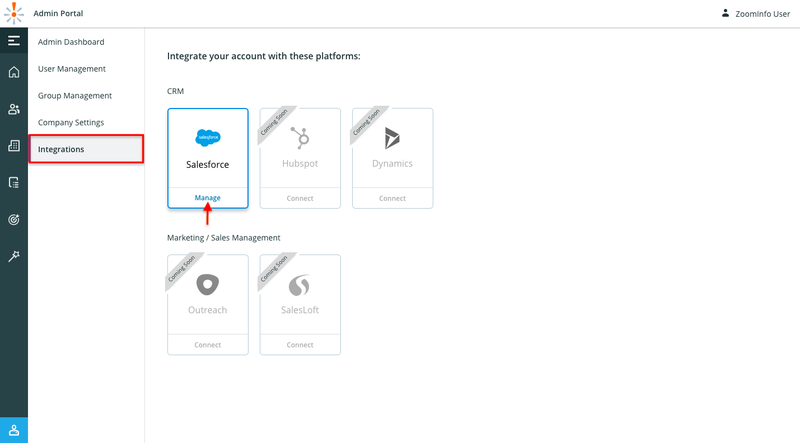 Within Admin Portal: Navigate to the Integrations page and click Manage under the Salesforce tile. Click on the Mapping tab at the top left. Accounts, Contacts, & Leads must be mapped individually and they can be found directly below the mapping tab. Note: Any required fields within your Salesforce will be marked with a red asterisk and all values listed under the Salesforce Field column come directly from your Salesforce instance. Note: Removing fields means that we will not be sending that data over to Salesforce. Note: if you have secondary required fields set up for a specific HubSpot field you won't be able to map to that field. When users are exporting to Salesforce, the Direct Phone will map to the Business Phone, but in the case that a specific contact does not have a Direct Phone then we will send the Company Phone to the Business Phone in your Salesforce.